My 4-year-old daughters have taken to playing in the lilac tree. They like to hang by their knees and swing from the branches. Remember those days? I do so love that photograph! It needs framing! I want to see a picture of how those curls came out! What a gorgeous photograph! Such a beautiful moment captured:) I'm with blueviolet...I'd be framing and hanging that one! How precious! I love this photo - it's so sweet, and will definitely be perfect for hanging on the wall. I love this photo. So sweet! How sweet. They are so cute. I never did that in trees but I did it on monkey bars. We used to sit up and flip backwards. Denise, our lilac is right outside the kitchen, too! It's the perfect size for the girls, because it's not so big that they can't easily climb around in it, but it's sturdy enough to hold their weight. Thanks so much for the kind words, Melissa! I love Kodiak. It reminds me a lot of where I grew up (Ketchikan): island, water, rainy, beautiful! CUTE! You have your own fairy tree. 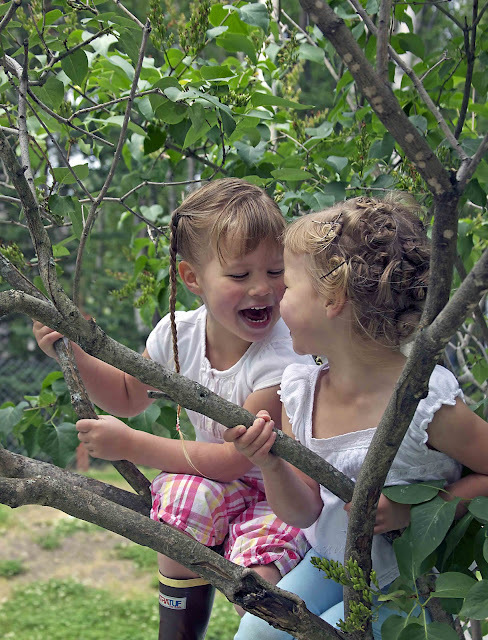 That's what we call our girls when they climb trees; Tree Fairies! So the tree is the fairy tree. I mostly see bare feet hanging down from it. You'd better have that picture blown up, framed, and hanging in their room -- it is fabulous!